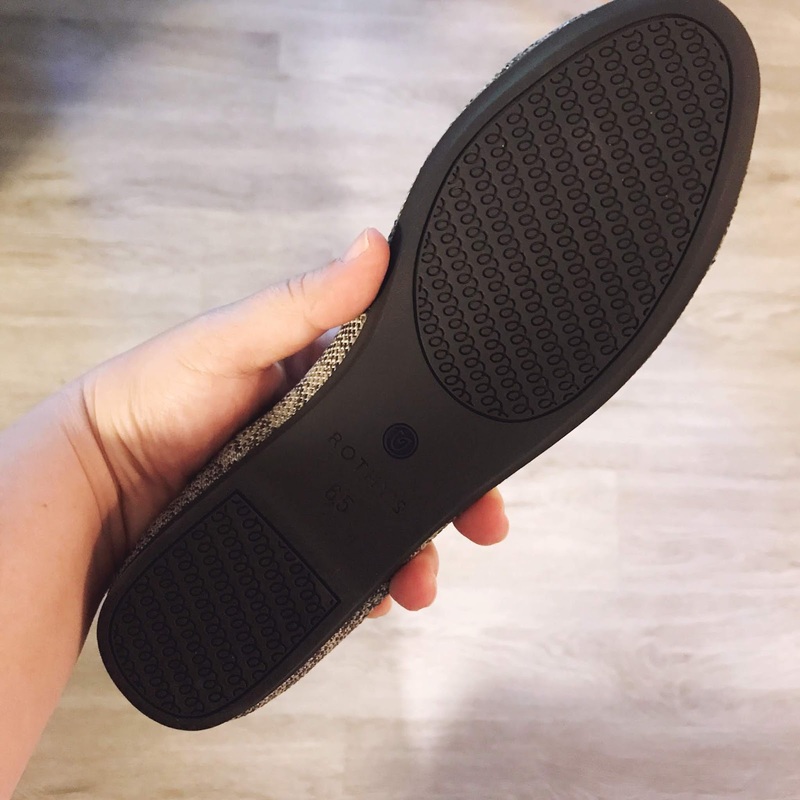 I purchased my own pair of Rothy's and decided to review them here on my blog. Click here for a coupon for $20 on your first pair, and I'll get $20 credit towards new shoes! 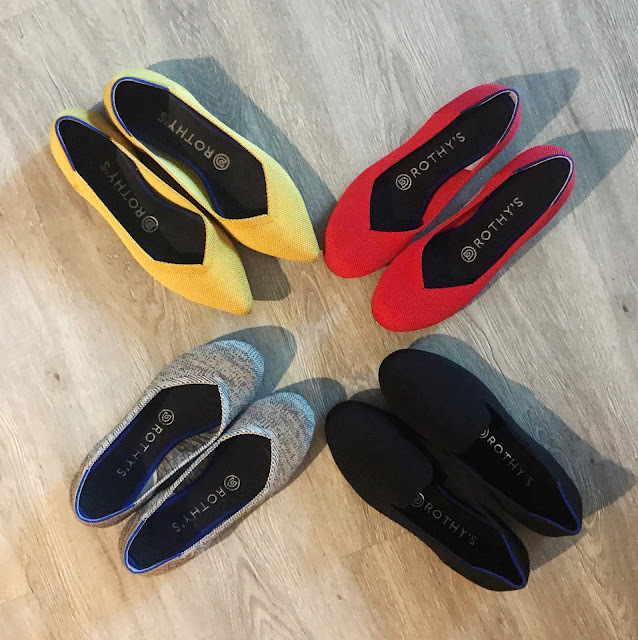 If you're like me, you've been getting hit left and right with targeted ads for pricey flats like Tieks and Rothy's that people are raving about! I didn't bite on the Tieks, mainly because I go through cheap flats like crazy, because my feet sweat a lot (#truth) and they get smelly. I don't usually splurge on shoes as a result; I buy $20 Target or Payless shoes and then toss them after a season. But then I started to notice friends and coworkers wearing Rothy's flats, and I was intrigued. They raved about how comfortable they were, but the kicker that got me was they were supposedly machine-washable. That in itself felt like a game-changer for me. The catch? The price range is $125-$165, depending on if you go ballet flat, pointed flat, or loafer. The only shoes I've ever paid over $100 for were combat boots or running/hiking shoes, something with a ton of function and not a lot of style! 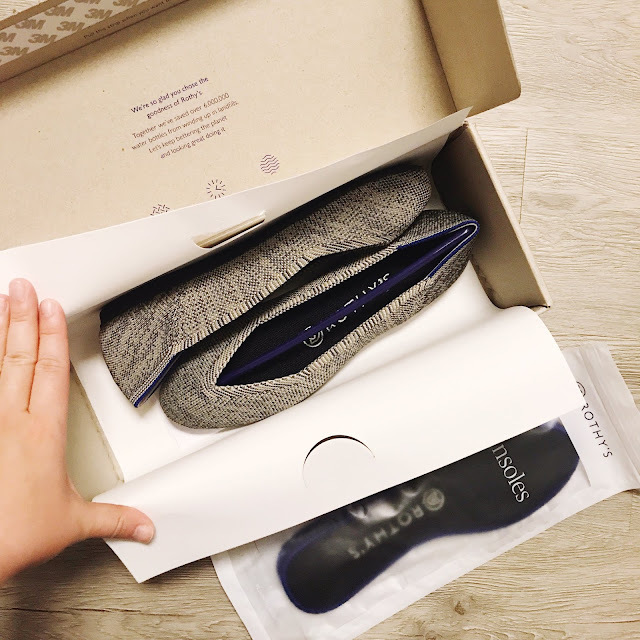 So I was definitely intimidated by the price tag... but after days of waffling about it, I finally took the plunge and ordered their signature ballet flat in the Taupe Heather color, a good neutral to match the most possible outfits! I also ordered an extra pair of insoles, because of my stinky/sweaty feet thing. When my shoes arrived, I got a little bit nervous; they looked narrow! But once I put them on, I was impressed. I felt like my feet were in house slippers. They were as soft and comfortable as TOMS, but way cuter and with a non-slipping rubber sole. I ordered a 6.5, which is my normal size in flats. Some people have been saying to size up for the pointed toe versions, but I haven't tried those yet. One complaint I saw in a Buzzfeed review of Rothy's was that you can see some stretch where your toes are. I find this to be minimally noticeable. The seamless feature of the shoes makes them so soft and comfortable from the get-go! I even went on a 1.5-mile walk during the work day in these shoes with NO BLISTERS. These are basically the only shoe I want to wear this summer that isn't a sandal! That said, if you require arch support and struggle with the lack thereof in normal flats, you're not getting much more out of these. You can probably slip your orthotics into them, but these are definitely for folks who wear flats all the time without issues. After about a week of 90-degree temps and sweating in my shoes, I decided to wash them. I took the insoles out and tossed all four pieces into my washing machine on cold, delicate cycle. I used our everyday detergent because it's what we use even for the baby's laundry: All Free & Clear. Then I air dried the shoes. Rothy's flats looked brand-new and kept their shape even after washing! I found that they mostly dried overnight, too. The bad smell from my sweat left them easily. In the future, I may sprinkle in a little scent boost, just to give a little fresh smell to them, since my detergent lacks perfume. They didn't smell anymore after washing, but I think adding a little scent will keep them smelling fresher for longer. When it came to comfort and machine washing, I LOVE my Rothy's! The sustainability aspect (they're made of recycled materials) is a great bonus. The only thing I don't like is the price. I really wish these were $99 instead of $125-$165, because I WANT MORE. I've already got my sights set on their pointed marigold flats, black loafers, and a red or leopard pair of flats. I would love to have a half dozen pairs of these to replace all of my cheapo flats. (Which, in my mind, would cost around the same ONE pair of Jimmy Choos, but it's still hard to justify in my head.) So I think I may buy one more pair this year, then ask EVERYONE to give me Rothy's giftcards for Christmas. 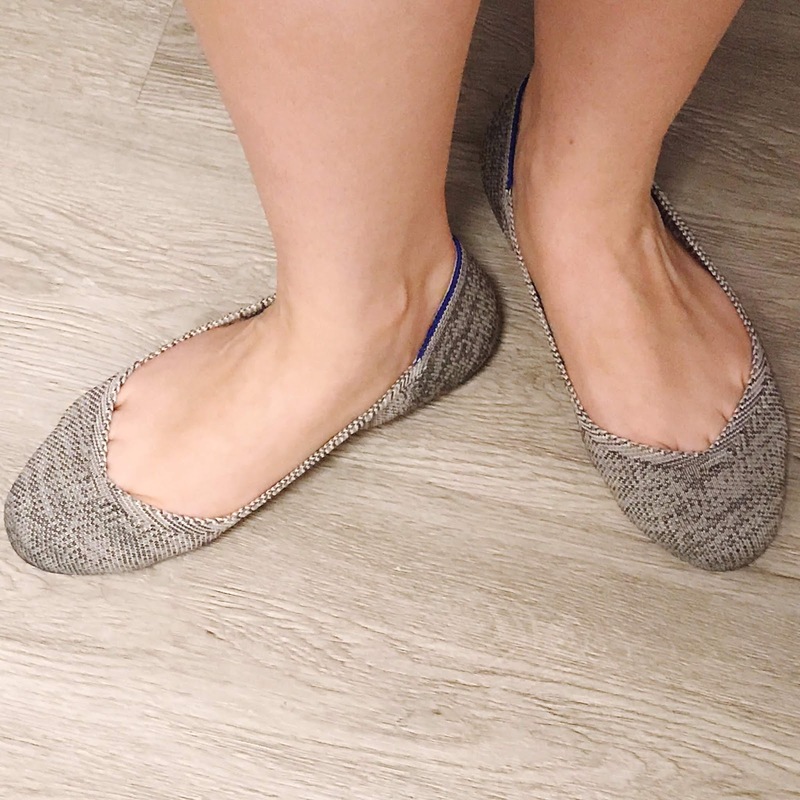 I don't think I've ever had a pair of flats I've liked so much! 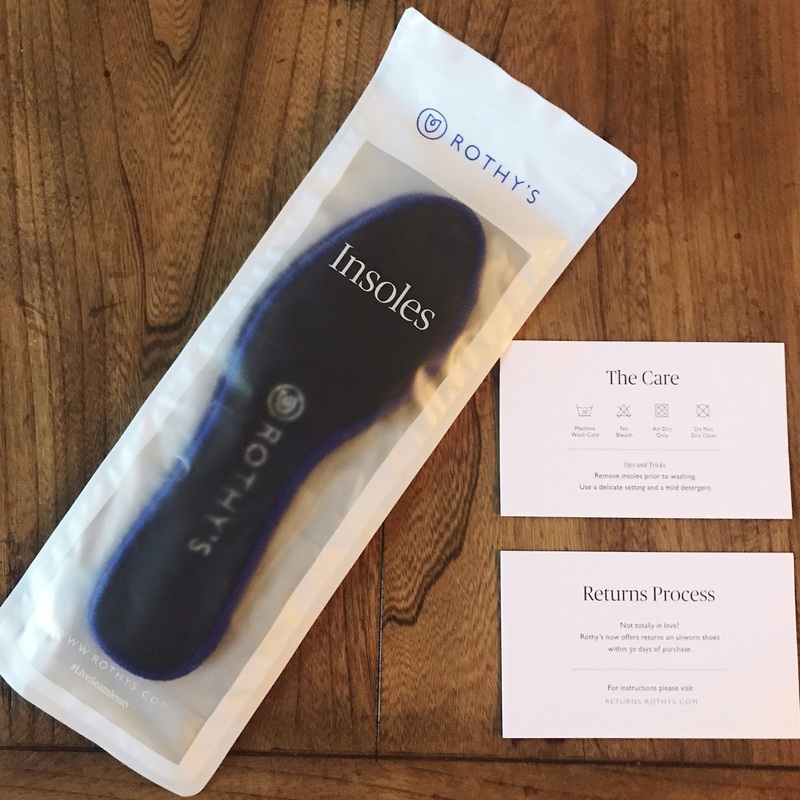 If you're thinking about purchasing Rothy's after reading this review, I'd love for you to get a $20 discount through referral, so I can also get a $20 credit towards my new favorite shoe. For once, I bought something from an internet ad that was legitimately perfect for me! Update 7/2/18, The Point Shoe & The Loafer: I next purchased a pair of Rothy's Point shoes in Marigold, a mustard yellow color. I ordered a 7 (my Flat round toes are a 6.5) based on some advice from the "Rothy's Addicts" Facebook group. They felt a little too snug on my outer toes, so I exchanged them for a 7.5. The 7.5 was perfect! Sometimes they feel a little loose, but they don't slide off my feet. I've also seen in the group that some of the newer colors are fitting more snug. After trying two colors of loafers, I figured out that 7.5 works best for me, which also happens to be my Point size. So to me, both the Point and the Loafer run smaller. Ugh, that is my one gripe about Rothy's... the quality control by style and color in terms of fit/size seems inconsistent. 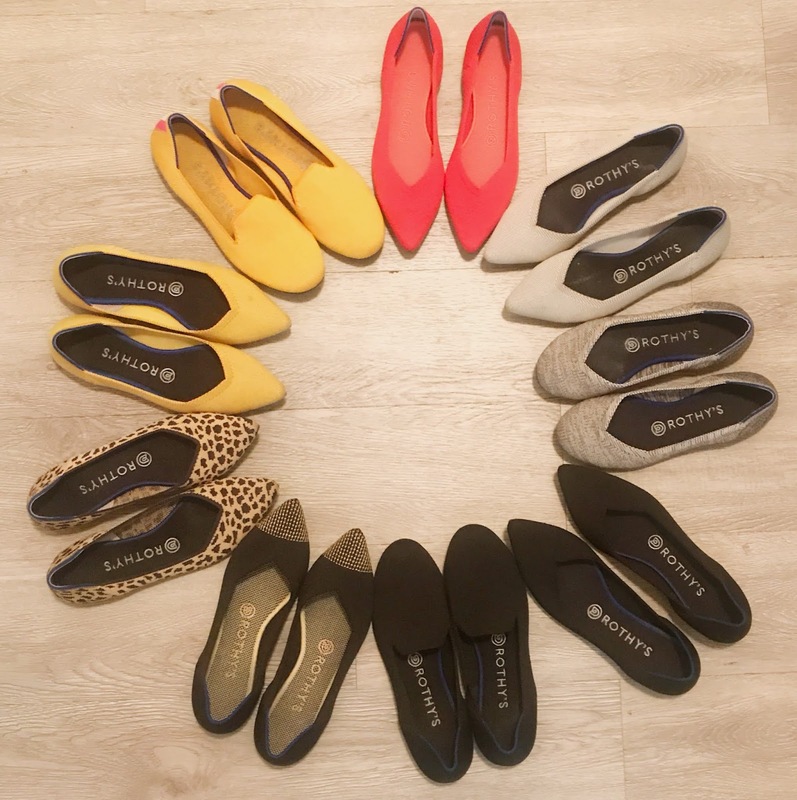 Update 2/7/19: I now have two pairs of flats, five pairs of points, and two pairs of loafers. Truthfully, most of these have been purchased using referral credits (THANK YOU, readers!). The points are my favorites, and I'm waiting on a new pair of red points to arrive. Overall, these shoes have held up really well! I haven't noticed much wear and tear, though my Marigold points (worn the most) show a little more than the others; I may get a second pair because it's my favorite color! I do tend to get a mark/smudge on my right heel from driving, but that's user inflicted, and it usually washes out when laundered. I'm still a fan, though I don't feel the need to buy them often because I have a good variety now. I have started throwing out old shoes that I don't wear because they've been replaced by Rothy's! I haven't felt inclined to buy the Sneaker, because I prefer other sneaker brands that are a bit less pricy. Also, due to demand, their shipping has slowed down noticeably. That's the price of popularity, I guess!